I had a really big misfortune when I returned from my trip. As you know it’s been a month since I returned but my posts suddenly stopped. I had a problem with my hard disc and had people trying to save all the photos. I am happy to say they are saved and I can finally continue writing about my travels. So if you don’t remember I have gone to UAE to visit Fujairah , Dubai and Abu Dhabi. My story suddenly stopped at Dubai, but now I can continue. 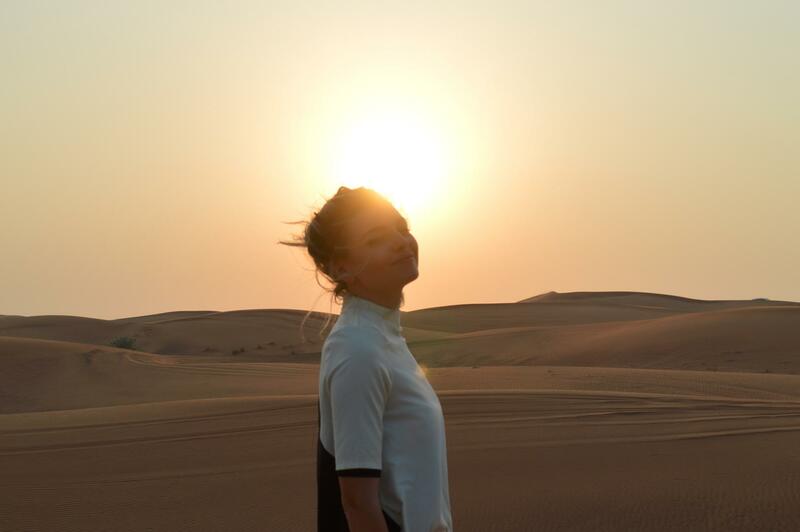 So one of my most amazing experiences in Dubai was the desert safari. I have never been to a desert before and I cans till remember arriving to the sand dunes. It was so beautiful. If you ever watched Aladdin as a kid it really reminded me of that. As we arrived to the sand dunes I couldn’t help but feel a huge gratitude towards life and what it has given me. To be here and witness this amazing work of mother nature was a blessing. A lot of things went through my head as I was driving in to the desert. Ot was peaceful, not a thing on horizon, and I was there, experiencing that moment of bliss. The sun was clear, not a cloud in the sky, just pure perfection. I was imagining I was in some Salvador Dali painting. Dubai is exactly that. It is his city. I decided not to edit this photos a lot, because the natural beauty of this place is out of this world. I cannot even explain how it makes you feel when you witness it. After running around in sad, we were taken to a place in the middle of desert where we had some entertainment and food. It was really hot that day! This place is in the middle of nowhere, and you need to be taken there with a car, that can drive on sand, on the way you get to experience dune bashing which is something like from a James Bond movie. Seriously thrilling. At the place you get some refreshments and food while you enjoy the show. It starts with an amazing dancer, goes to fire show and to a belly dancer. All the shows are really great and exciting to watch. During the break we got some food from the buffet, it was a big mistake to eat it. The problem was not he food but the temperature. Let me explain. When it was sunny it was like 50 + celsius. The sun came down, and we started to cool down. One we ate our body temperature risen and we all started sweating like pigs. I must not remind you that the food there is quite heavy and seasoned, so if you are not used to it and it falls hard on your stomach, your body will need a lot more energy to process it. The whole experience was really amazing. I have to admit we were looking forward to going back to the hotel because we needed air-condition after all the food we had. However it is not a reason not to do it. You have to do it! It is one of my favourite experiences.